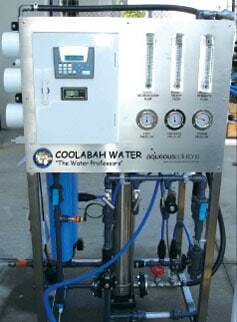 The AS 5,000 reverse osmosis desalinator plant will provide nominally 5,000 litres of purified water every 24 hours. The unit incorporates a shutdown flush cycles that help protect the membranes and help ensure a trouble free operation. On shut down the highly salty brine water around the membranes is flushed away using bore water to provide protection of the membranes while sitting idle. The unit will produce fresh water which would be fed to a fresh water (permeate) tank and reject brine for disposal. A level switch is provided which is placed in the permeate tank to allow the unit to start up and shut down automatically according to level. The unit operates under full automatic control and only requires the start button to be pushed to start and stop the machine. The unit runs unattended and requires no operator input during normal operation apart from periodic topping up of the antiscalant dose tank.